This vehicle kit includes everything you need to liven up your daily drive with SiriusXM satellite radio programming. This vehicle kit includes everything you need to liven up your daily drive with SiriusXM satellite radio programming. The SXDV3 Car Kit lets you enjoy all your favorite programs from the comfort of your driver's seat, using your SiriusXM Dock & Play radio and a compatible receiver. The package includes a docking station, dash-mount bracket, DC power supply/FM transmission antenna (cigarette lighter adapter), and a magnetic antenna, so you'll have everything you need to enjoy SiriusXM programming in your car. This kit is compatible with most SiriusXM, Sirius, and XM Dock & Play satellite radios, which are sold separately. The perfect way to use my SiriusXM account in multiple vehicles and my home. 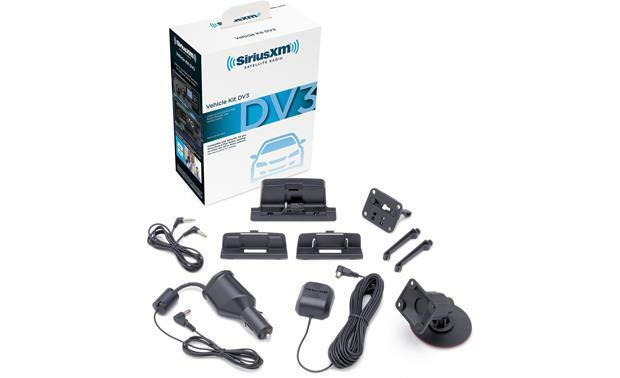 SiriusXM Vehicle Kit (SXDV3): The XM Dock & Play PowerConnect Second Vehicle Kit (SXDV3) allows you to install select SiriusXM, XM, or Sirius Satellite Radio dock & play tuners in your vehicle. Note: In addition to the dock & play tuner, a subscription to SiriusXM, XM, or Sirius Satellite Radio is also required. 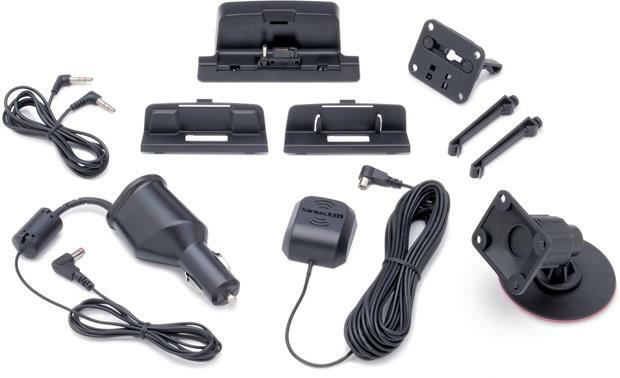 Vehicle Dock: The SiriusXM Vehicle Kit includes a docking cradle to connect your compatible Satellite Radio tuner in the vehicle. The vehicle dock features color-coded connectors to assist you in connecting the cables to the correct connector. The vehicle dock provides three connection options to transfer Satellite Radio audio to your vehicle's audio system. PowerConnect: The SiriusXM Vehicle Kit comes supplied with a PowerConnect FM transmitter/cigarette lighter adapter which allows your Satellite Radio receiver to wirelessly transmit audio to your vehicle's in-dash head unit over and FM frequency. You can choose from any FM frequency between: 88.1 and 107.9 MHz. You can store up to 5 FM stations so you can quickly access the stations which give you the best audio reception when using the PowerConnect. The PowerConnect FM transmitter/cigarette lighter adapter simply plugs into the power port of the included vehicle dock and the cigarette lighter or 12-volt accessory port of your vehicle. Auxiliary: The vehicle dock has a minijack audio output (3.5mm) to connect the unit directly to your in-dash head unit's auxiliary input (if applicable), using the supplied stereo minijack cable. When using the line output jack, you can adjust the level to match your head unit's other sources. FM Direct (optional): The FM Direct Adaptor (607FMDA25, sold separately) connects directly in-line with your vehicle's existing AM/FM antenna input (Motorola) and the SXDV3 vehicle dock's FM output (2.5mm). This optimizes the signal of the PowerConnect FM transmitter/cigarette lighter adapter's built-in FM modulator to your vehicle's radio, especially in regions with a high density of FM radio stations and few open FM channels. Magnetic Antenna: The SiriusXM Vehicle Kit unit comes supplied with a magnetic antenna that is designed to be run outside of the vehicle and placed on the roof of your vehicle. The magnetic antenna will adhere to your vehicle's sheet metal. Mounting: The mounting location of the SXDV3 should be easily accessible for controlling your docked XM receiver and provide good visibility of the unit's display, and should not be located where it will be in direct sunlight, which will affect the visibility of the display screen. The SiriusXM Vehicle Kit comes with two mounting options. Self-Adhesive Dash Mount: The SXDV3 includes a self-adhesive plastic mount which allows you to place the unit on your vehicle's dash. The self-adhesive dash-mount allows you to swivel and adjust the unit for better visibility. Vent Mount: The SXDV3 also includes a vent mount bracket, so the unit can be mounted to your air conditioning vent. Note: When mounting the SXDV3 in your vehicle, choose a location where it will not block your vision, interfere with the controls, or obstruct the air bag. Does this kit work with the Sportster 4? Would contact series about the base matching the radio.I bought the kit installed it.I had no power, I had Sirius send a new signal, the radio was not acceptin the signal. My fix was to buy a new radio head. Be careful and don't waste money. do you need an auxiliary port on your radio to operate this kit? I forwarded your question to an Advisor and they responded with the following: This will work through an Auxiliary port if you have one, but if you don't you can also use it as an FM transmitter. If you would like to discuss further you can contact an Advisor directly by phone (1-800-324-9695) or online chat. Searches related to the SiriusXM SXDV3 Car Kit Listen to your SiriusXM Dock & Play tuner while you drive (subscription sold separately by SiriusXM).